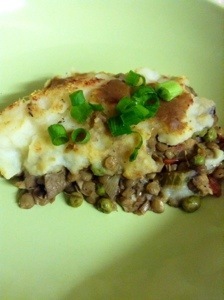 Oh, shepherd’s pie, you have eluded me for so long. 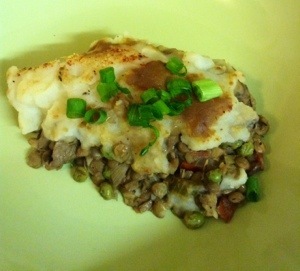 I tried my hand at lentil shepherd’s pie, mushroom shepherd’s pie and then I realized where I was going wrong: I had to combine the two. Using a mix of crimini mushrooms, wild mushrooms and brown lentils gives it a unique texture and flavor combination. Use fresh wild mushrooms if they are available in your area. This is great comfort food on a cold, rainy day. It’s also convenient to prepare ahead of time and bake when needed for company or after a busy day. Cook potatoes in boiling water and salt. Drain when soft. Add Earth Balance and milk to pot and heat through. Add potatoes back in and mash with a potato masher. Add more milk as needed. Season with salt and pepper. Set aside. 4) Add lentils, bring back to a boil then reduce heat and simmer for 25 minutes or until cooked through. Toward the end of cooking, stir in peas. 5) Add cornstarch mixture until sauce is thickened and then remove from heat. Add salt and pepper to taste. 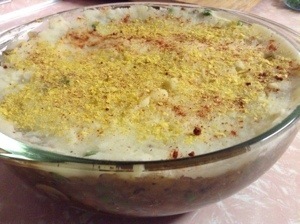 6) Set on the bottom of a casserole dish and top with mashed potatoes. Sprinkle nutritional yeast and paprika on potatoes. 7) Bake for 25-35 minutes, until top is golden and mixture is bubbling. Slice and serve. Garnish with green onions. Alternatives: If fresh herbs are not available substitute dried. Herbs de Provence work wonderfully in this recipe.